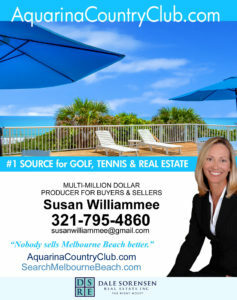 With Aquarina Beach and Country Club’s incredible barrier island location and golf, tennis, beach and boating amenities, it’s no surprise this is a very desirable destination for vacationers! There are no weekly rentals in Aquarina. Most properties are restricted to seasonal rentals of 3 or more months (a few properties allow for 1 month rentals) AND rental inventory is very limited. Please email me if you would like more information about any of the above listings – or if you would like an agent to monitor the market for new opportunities as they become available. If you are interested in weekly vacation rentals in the Melbourne Beach area, you might want to consider looking on VRBO.com. Also, there are some terrific B&B’s up in the town of Melbourne Beach!